‘Wow! Just Wow! Would you look at that view?’ I found myself saying this, many times during my stay at the Myconian Avaton Resort. As we made our way up to the resort on the top of the hill, there were audible gasps as we got our first proper view of the sparkling Aegean Sea that stretched out miles towards the horizon. 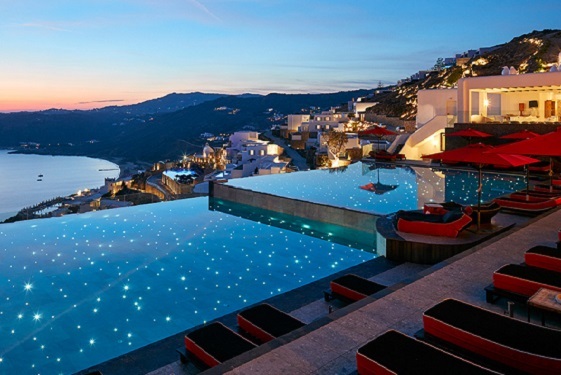 Located in Elia Beach, Mykonos and perched high upon the hillside, the Avaton makes the views of the bay one of its standout features. Taking advantage of clever architecture and design, and the rules of the island that buildings cannot be higher than two levels, all areas of the hotel allow for beautiful vistas of the Aegean Sea. Each of the nine Myconian Collection hotels has its own distinct personality and style. The Avaton is seriously chic with a real sense of fun. The bright colours of the lobby and pool area sit nicely against the whitewashed buildings and the bold style is carried through into the décor of the rooms. Quirky design touches such as large ceramic penguins dotted around the pool, mirrored feature walls and modern black and white prints of local people add to the ambience. TLTB also loved the large and bold ‘AVATON’ which is spelled out in metal letters in the lobby – this hotel is proud of its unique style. After a lovely welcome drink on the balcony and a seamless and friendly check in, I went to my Sea View room with private pool, I was overwhelmed by how beautiful my accommodation was. My large balcony was extremely private, so it didn’t take me long to be lounging back under the Greek sun with my feet in the pool. All of Avaton’s accommodation has sea views and most have either a private pool or jacuzzi. They range in size from guest rooms for two adults to suites and villas which can accommodate up to 10 adults. Despite having my own private pool, I found myself returning daily to the main pool. It is a beautiful infinity pool which really is at the heart of the hotel. TLTB loved the large comfy loungers around the pool and friendly bar staff who were more than happy to recommend a delicious cocktail to sip on while sunbathing. If guests wish to dip their toes in the Aegean, a shuttle service can be arranged to take you down the hill to the resort’s private beach. TLTB made use of the resort’s shuttle service regularly during our stay and it can be used to transport guests to neighbouring hotels or into the town. We never found ourselves waiting longer than ten minutes for the shuttle to arrive. After a tiring day of sunbathing, it was time for a little indulgence at the spa. I opted for a rehydrating facial which was extremely relaxing and left me with immediate pleasing results on my skin. My travel companion opted for a massage and declared it ‘the best massage I’ve ever had’. The spa features Thalassotherapy pools - four pools of different essential oils and therapeutic salts plus powerful hydromassage jets - Very relaxing! Should guests wish to venture outside of the resort a transfer to Mykonos town can be arranged. Staff can also arrange excursions, yacht and helicopter rentals and leisure activities such as water sports or horse riding. When I was first checking into the hotel, I was greeted by the hotel manager who proudly assured me that Avaton’s guests ‘should forget their diets’ and as the food is so good he expected us to put on at least 2KG before we left. He wasn’t kidding, the Myconian Collection food is really very delicious. The restaurant on the Avaton site serves a menu of breakfast, lunch and dinner and offers al fresco dining, (once again - amazing views on display!). As you would expect from a hotel so passionate about its location, the menu features traditional Mykonian and Greek dishes, as well as international cuisine. The restaurant focuses on a use of on seasonal organic ingredients and locally sourced fresh produce and local vintage wines. As a guest of the Myconian Collection, Avaton’s guests can also dine at restaurants at the other hotels, taking their pick from a range of dining experiences from gourmet cuisine to poolside snacks or artisan cocktails. Throughout the estate of Myconian Collection properties all raw ingredients used are either produced at private farms entirely under the group’s supervision or locally and exclusively for them, by well-trusted professionals who have worked with Myconian Collection for many years. One highlight of the dining experience for TLTB during our visit was to the new Japanese restaurant at the Myconian Imperial Resort. TLTB enjoyed a lovely evening, savouring the most delicious Sushi. Dining while accompanied by a pianist playing in the background as the sun set over the horizon only added to the beautiful ambience. The Myconian Collection proudly say that great hospitality is at the heart of all their hotels. According to the family who own the group it is essential as ‘Great hospitality is like sustaining the romance in a serious relationship’. Avaton might have the amazing views and great facilities but what really stood out to me during my stay was the hospitality and passion of its staff. All the staff who I encountered from the shuttle drivers to the housekeepers to the receptionists were so genuinely enthusiastic about ensuring their guests are happy. I left Avaton, a little bit sunkissed, much more relaxed and extremely well fed on delicious food and local wines - Yammas! But now if you excuse me, I’ll be in the gym working off the extra 2kg I gained (it was worth it though! ).